Smokin' Mango with Chipotles A mango twang with a tomato backup, three kinds of chillies, jalapeno, cayenne, and chipotle (smoked jalapeno). This sauce will treat you to a new level of bbq sophistication. For those who require zest in their tomato sauce. 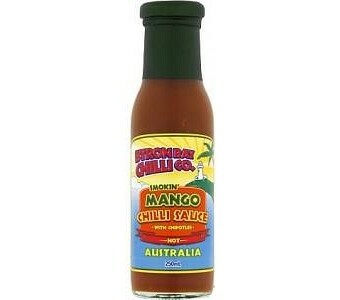 Ingredients: Mango (26%), tomato, water, jalapeno chilli (10%), cider vinegar, onion, golden syrup, brown sugar, chipotle chilli (3%), cayenne chilli (2%), garlic, spices, salt.